Christopher Pyne (left) and Steve Ciobo are set to announce they will not contest their seats at the May election. These foreshadowed departures – in this case within the same portfolio area – open the government further to Labor’s criticism of being a lame duck administration. Cabinet ministers Kelly O’Dwyer and Nigel Scullion, junior minister Michael Keenan, and former deputy leader and foreign minister Julie Bishop have earlier announced they are leaving at the May election. Michaelia Cash and Mathias Cormann have delivered the death blow to the prime ministership of Malcolm Turnbull. Malcolm Turnbull has been delivered a political death blow, with the resignation of three senior cabinet ministers – Mathias Cormann, Michaelia Cash and Mitch Fifield. They said in a joint news conference shortly before 10am that they had advised Turnbull on Wednesday and again Thursday morning that he no longer had party support. Senate leader Cormann, whose position has always been considered crucial in the leadership battle, said he had been told by five cabinet ministers who had voted for Turnbull on Tuesday that he no longer had their support. “It’s with great sadness and a heavy heart that we went to see the prime minister yesterday afternoon to advise him that in our judgment he no longer enjoyed the support of the majority of members in the Liberal Party party room and that it was in the best interests of the Liberal Party to help manage an orderly transition to a new leader. “I can’t ignore reality”, Cormann said, who on Tuesday pledged continuing support to Turnbull in comments to the Senate. A party meeting is now inevitable. The crucial question is whether Turnbull stands aside to open the way for Treasurer Scott Morrison and deputy Liberal leader Julie Bishop to possibly run. Early Thursday morning, Peter Dutton demanded Turnbull hold a second leadership vote, as the government was locked in crisis. Dutton told reporters: “I called the prime minister to advise him that it was my judgment that the majority of the party room no longer supported his leadership. He said he would not have contacted Turnbull if he did not have majority support. But Turnbull at that point was holding out, his camp arguing that Dutton supporters had not shown they had majority support – 43 MPs – for their call for a special meeting. The Dutton camp circulated a petition on Wednesday night for a meeting. The canvassing has been accompanied by inducements and arm twisting by the Dutton campaign. The number who have signed the petition is unknown. Senior ministers were bunkered down in Turnbull’s office before the press conference by the three ministers. Two more frontbenchers resigned earlier Thursday – Zed Seselja, assistant minister for science, jobs and innovation, and Michael Sukkar, minister assisting the Treasurer. They were among the multiple ministers who offered to resign earlier this week but did not have their resignations accepted. With serious doubt over his constitutional eligibility to sit in parliament, Dutton released legal advice that he had sought last year. This relates to whether his interest in childcare centres through a trust breaches section’s 44 provision on conflict of pecuniary interest. The advice argues that Dutton has no conflict. Releasing it on Thursday morning, Dutton said “there has never been any doubt about my eligibility”. He said a “spurious and baseless campaign” had been waged against him on the matter. Dutton supporter Craig Kelly said if there was any doubt about the matter it could be settled by selling the childcare centres. A Labor move in the parliament to refer Dutton’s eligibility to the High Court was this morning defeated by 69-68. Other ministers have flocked to the prime minister’s office to quit – Angus Taylor, Alan Tudge, Steve Ciobo, Michael Keenan and Greg Hunt all confirmed they had tendered their resignations. The government has cancelled the House of Representatives for the day. Leader of the House Christopher Pyne moved the motion for adjournment, which was carried 70-68. Manager of opposition business Tony Burke told the House: “What is happening right now is the government have decided that this place has fallen apart so completely that they are dissolving the parliament for the day entirely. Opposition Leader Bill Shorten said Labor had been prepared not to call divisions while there was a Liberal Party meeting. Labor deputy leader Tanya Plibersek said: “Those opposite, they’re not conservatives, they are vandals. “Not one of the three people that we’ve heard touted as prime minister deserves the job. “We have one with no authority – that’s the member for Wentworth, no authority [Malcolm Turnbull]. We’ve got one with no legitimacy. That’s the member for Dickson [Peter Dutton]. We’re not even sure that he’s eligible to sit in this parliament. And we’ve got one with no decency. The member for Cook [Scott Morrison] has never had the courage to nail his colours to the mast. Is he a conservative? Is he a moderate? Where does he stand on all this division? He is like a hyena circling around the corpse of the modern Liberal Party waiting for his chance, waiting for his chance to come up the middle. The House now won’t sit until September 10. The Senate has voted 34-28 to refer questions about Peter Dutton’s intervention as immigration minister on the visas of two foreign au pairs to a Senate inquiry. The motion referred to the Legal and Constitutional Affairs References Committee for inquiry and report by 11 September “allegations concerning the inappropriate exercise of ministerial powers, with respect to the visa status of au pairs, and related matters”. In one case an au pair whose visa was cancelled at Brisbane airport in June 2015 made a phone call and soon after Dutton approved a visa. Reportedly Dutton went against written concerns from his department that giving a visa to a second au pair was of “high risk”, on the ground that earlier she had been warned about work restrictions. Dutton and his department have consistely blocked attempts to give a full explanation of his actions. Barnaby Joyce has denied he breached ministerial standards with the employment of his partner, Vikki Campion. 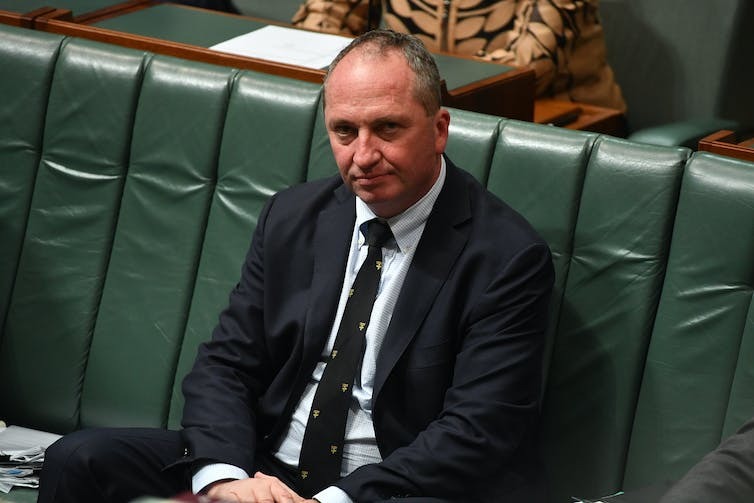 Deputy Prime Minister Barnaby Joyce continues to face questions about the employment of his former media adviser – now current partner – Vicki Campion. Campion left Joyce’s office last year to take another ministerial adviser position with Resources Minister Matthew Canavan, and then with Nationals whip Damian Drum. Prime Minister Malcolm Turnbull has claimed Joyce did not breach the Statement of Ministerial Standards regarding employment of spouses and family members as Campion was not his partner at the time of her appointment. Joyce has also denied he breached the ministerial rules. What is the role of ministerial staffers? Ministerial advisers are politically partisan staff who are personally appointed by ministers to work out of their private offices. These advisers have become an integral part of the political landscape in the last 40 years. The number of Commonwealth ministerial staff increased from 155 in 1972 to 423 in 2015. … a ministerial adviser deals with the press. A ministerial adviser handles the politics. A ministerial adviser talks to the union. All of that happens every day of the week, everywhere in Australia all the time. Including, frankly, the odd bit of, you know, ancient Spanish practices and a bit of bastardry on the way through. That’s all the nature of politics. How do they fit in our system of government? The modern Westminster ministerial advisory system is built on the 1853 Northcote-Trevelyan report in Britain. In the 18th and early 19th century, it was difficult to be appointed to a UK government office unless you were an aristocrat with the right connections to a very small elite. The Northcote-Trevelyan report rejected appointment based on patronage. It argued this led to difficulties in getting a good supply of employees in the public service compared to other professions. This report forms the basis of the Westminster public service today. Public servants are expected to be neutral and apolitical, and recruited and promoted on the basis of merit. The intention was very much to purge the system of patronage. Ministerial advisers pose a challenge to the Westminster system as they are largely recruited on a partisan basis and are expected to be politically committed to the government of the day. This undermines the intentions of having ministerial advisers who are recruited on the basis of merit, rather than patronage. How are ministerial staff appointed? Australian ministerial advisers are employed under the Members of Parliament (Staff) Act as ministers’ personal staff. The employing minister determines the employment terms and conditions of ministerial advisers; the prime minister can vary these. The law is sparse and does not stipulate any precise requirements in terms of staff appointments. In practice, the appointment of ministerial advisers is based on a party-political network of patronage. The primary consideration is loyalty to the political party – not merit. There have been notorious instances of the appointment of unsuitable staff. These include then deputy prime minister Jim Cairns’ appointment of his mistress, Junie Morosi, as his principal private secretary (although she was considered spectacularly unqualified for her position). Grattan on Friday: Is Barnaby’s baby a matter of ‘public interest’ or just of interest to the public? Some prime ministers have instituted a centralised process to reduce the appointment of unsuitable candidates. However, my research has shown that some senior ministers are able to circumvent such a process due to their position within the party. Also, these processes primarily seek to filter candidates based on political danger – rather than on merit considerations. Is there a breach of the rules in Joyce’s case? Turnbull’s Statement of Ministerial Standards provides that ministers’ close relatives and partners are banned from being appointed to positions in their ministerial or electorate offices. They also must not be employed in the offices of other members of the executive government without the prime minister’s express approval. Joyce and Campion claim their relationship started after her appointment – so the government has argued this clause does not apply. However, the ministerial standards also specify that ministers must declare any private interests held by them or members of their immediate family. And under the Statement of Standards for Ministerial Staff, ministerial advisers have to disclose – and take reasonable steps to avoid – any real or apparent conflicts of interest connected with their employment. Staff are required to provide their employing minister and the special minister of state with a statement of private interests. Therefore, the relationship between Joyce and Campion should have been disclosed when it arose, as there might have been an apparent conflict of interest connected with Joyce’s ministerial position. It is then up to the prime minister to decide what is to happen following this. But both the standards for ministers and for their advisers are not legislated. They are not enforceable in the courts or in parliament. Enforcement is handled completely within the executive, which has an incentive to bury embarrassing material wherever possible. This means any breaches of the standards by ministers and their advisers would be handled behind closed doors, without any formal scrutiny by parliament or any external bodies. The enforcement of ministerial and adviser standards has been patchy. Whether a minister resigns depends on the prime minister of the day and if there is media furore and public outrage over an issue. Are the rules too lax? The legislation governing the employment of advisers is sparse and limited to affirming ministers’ powers to employ their advisers. Beyond this, there is no legislative requirement for ministerial advisers to adhere to certain behavioural rules. The weak appointment rules have allowed Campion to be shuffled around different offices without a formal appointment process. Other Westminster countries have stricter restrictions on the employment of advisers, either through a cap on the number of advisers (as in the UK) or a cap on the total budget for advisers (as in Canada). The UK has a cap of two advisers per minister. Australia has no such limits. Australia has the weakest regulation of ministerial staff when compared to other similar Westminster democracies. Other countries have stricter regulations that both restrict the actions of advisers and increase transparency. Australian ministerial staff are now very important players in our democracy, but ministers and advisers are weakly regulated within our system. The law has lagged behind, but now is the time for reform. Labor says decisions made by Barnaby Joyce and Fiona Nash are open to legal challenge but Attorney-General George Brandis suggests the two former ministers were not the ones who actually made them. Joyce and Nash were disqualified from parliament by the High Court on Friday for having been dual citizens when elected. The opposition says at least 20 executive decisions and 47 ministerial announcements made by Joyce could be open to challenge. These include the controversial decision to relocate the Australian Pesticides and Veterinary Medicines Authority to Armidale in his New England electorate, various grants and appointments, and any decisions under the Water Act, where he had power to determine claims for payment to water access entitlement holders. The list comes from a paper Labor sought from the Parliamentary Library on the ministerial decision-making powers exercised by Joyce and Nash, and specific important decisions they made. Joyce had ministerial responsibility for agriculture and water resources. Nash was minister for regional development and regional communications. The opposition says at least eight executive decisions and 43 ministerial announcements made by Nash could be subject to challenge. These included elements of each of the regional NBN rollout, the mobile blackspots program and the rural decentralisation program, as well as grants under the Building Better Regions Fund. Labor has as well released updated advice from senior silks Matt Albert QC and Matt Collins QC about the legal status of decisions made by the former ministers. The Constitution allows a minister to hold office for three months while not being a member of parliament. The legal advice says that any decision made by Joyce or Nash after three months had lapsed from their appointment as ministers was open to challenge. “Any decisions made by Joyce and Nash, purportedly in their capacity as a minister, on and after October 20, 2016, are open to challenge. “The likelihood of proceedings being brought to challenge such decisions is high, having regard to the significance and seniority of their relevant portfolios,” the advice says. Brandis said the government was looking very carefully at the question of the validity of the former ministers’ decisions. But “I doubt that there are many if any decisions that would be relevant in any event”, he said on Sky. Tony Burke, manager of opposition business, told the ABC there would be “vested interests” with an interest in challenging decisions of Joyce. “When you’re in charge of Australia’s quarantine service, there’s importers and exporters who make or lose money depending on decisions you make. “There’ll be a series of decisions there with vested interests now combing through, and there being a whole lot of legal doubt over those decisions on the simple basis that Barnaby Joyce didn’t do what Matt Canavan did,” Burke said. “Matt Canavan turned out to have been legally in parliament. But at least he took the precaution to step aside so that there was no risk to there being illegitimacy to his decisions. Burke said there was a reason why the government had not revealed the solicitor-general’s advice. “I don’t believe for a minute it was as strong as they were claiming,” he said. It’d be better for ministers like Barnaby Joyce to have any potentially contentious decisions made by an acting minister until their citizenship issues are resolved.